I’ve found that pilots appreciate well designed and specialized tools. Heck, some pilots still lug around their E6B flight computer because it works and it works well, even though the same thing can be done with an app on their phone. 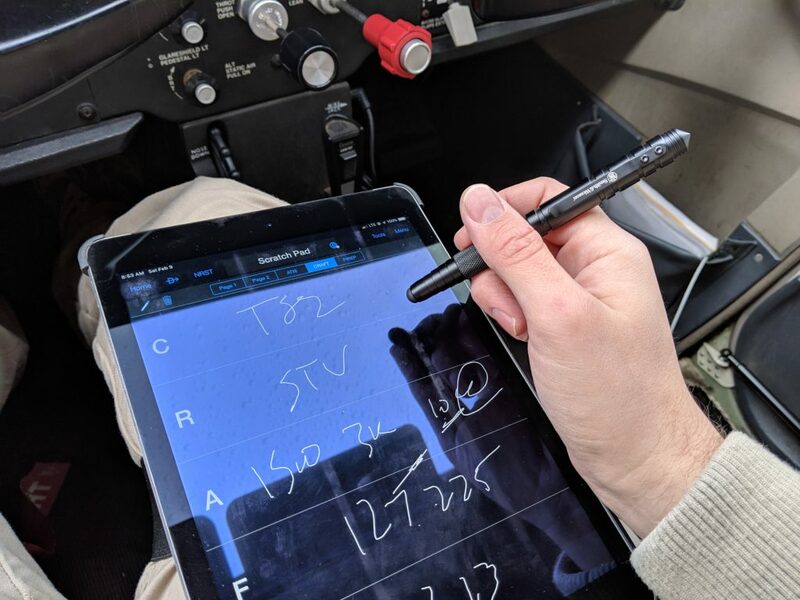 I was looking for a similar solution to my writing needs, a single tool able to draw on my tablet touchscreen and still write on the actual paper paperwork for each flight without breaking after a handful of uses. Enter the Smith & Wesson SWPEN3BK. Let me back up and provide some more context here. I love Garmin Pilot. 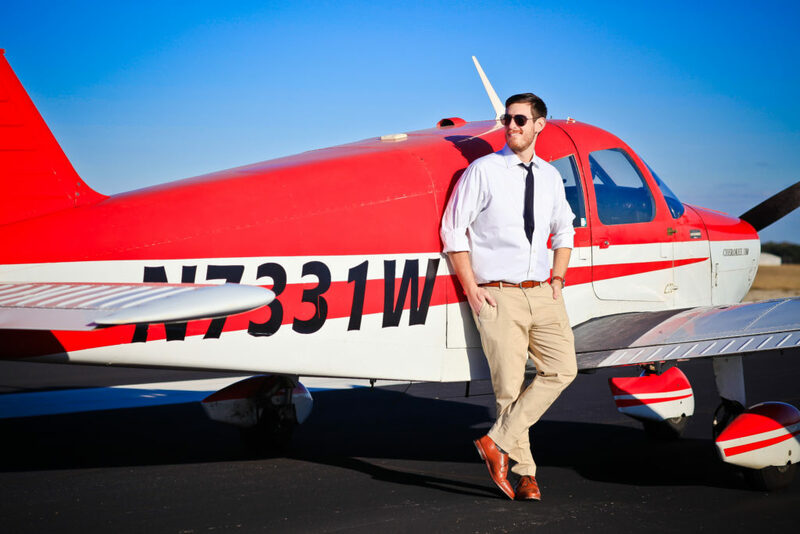 It’s a great app, providing all the needed functionality of an Electronic Flight Bag or EFB. And my preferred method of keeping it handy in the cockpit is to strap it to my leg with a MyGoFlight mount and use it like a kneeboard. The problem: now I don’t have a pad of paper on my knee for notes. Garmin Pilot tries to fix this issue by having a scratchpad functionality built in, the ability to freehand make notes on the screen and even has some templates for IFR clearances, ATIS information, PIREPs, and more. I think the intent is that the pilot would use their finger to draw on the tablet but for me (A) that method is so slow that I can’t keep up with the information on the radio and (B) using my finger is so illegible that it’s basically useless. The solution is to use a stylus, a pen that has a squishy bit on the end that allows it to operate with a touchscreen. 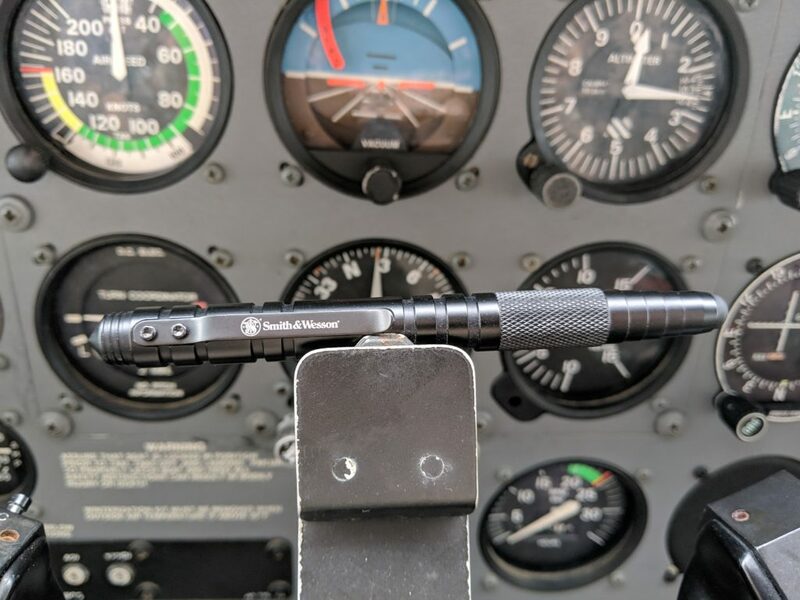 It solves all those problems, but the average stylus lasts about two and a half flights for me before breaking apart in my flight bag. I needed something tougher. 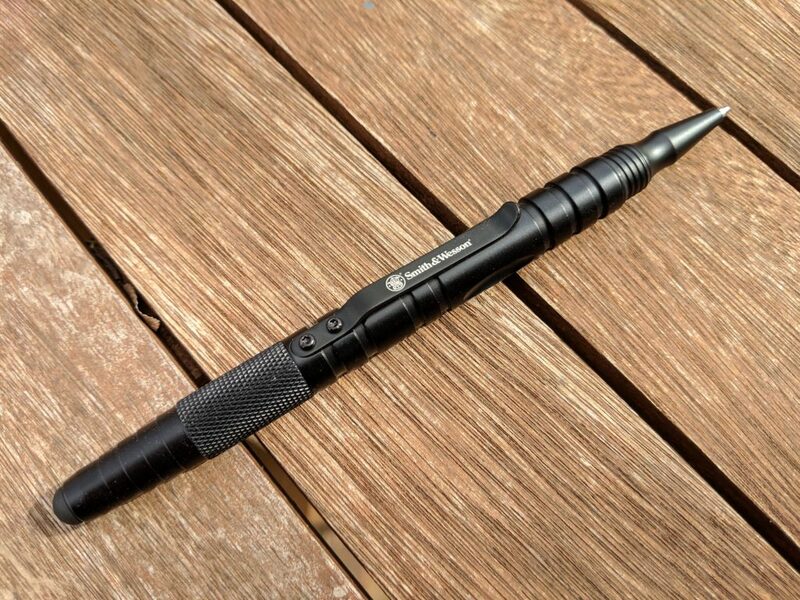 The Smith & Wesson “tactical pen” that we’re reviewing today is a chunky guy made from aviation grade aluminum. 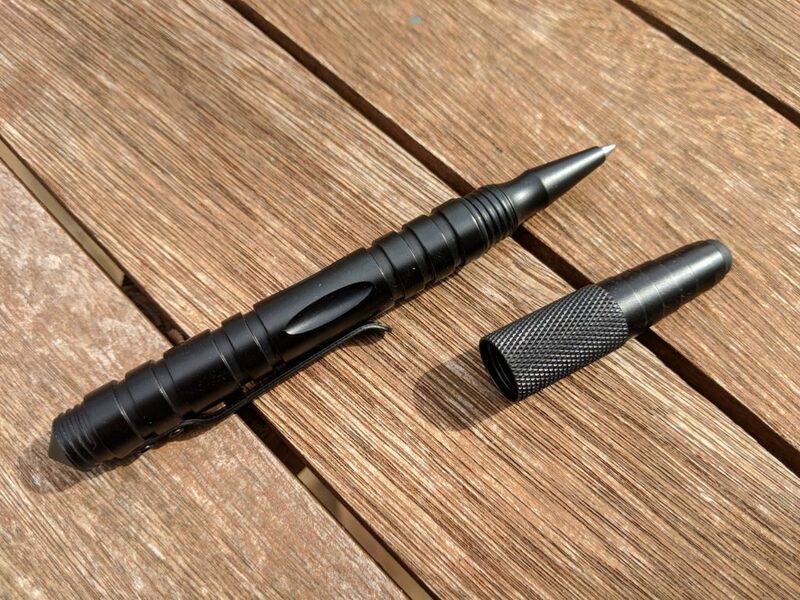 IN its normal state one end of the jet black pen is tipped with the soft squishy tablet stylus, and the other end has a relatively pointy metal tip that works well as a glass breaker or other similar punch tool. 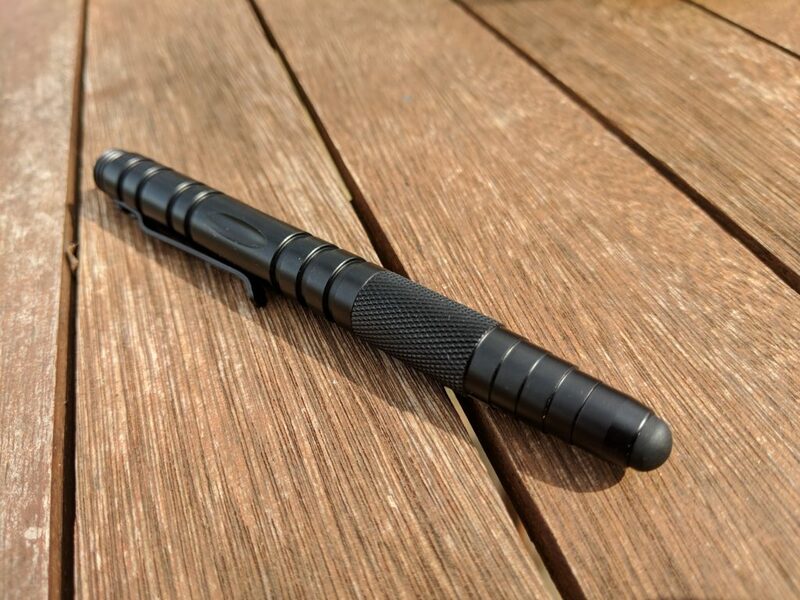 In the middle there’s a bit of knurling that makes the pen very easy to hold and maneuver, especially if your hands are wet. One of the biggest issues I think I have with this is that glass breaker on the end. It can be very easy to mistake the wrong end of the pen and start trying to scratch your tablet screen. I don’t think you’re likely to actually make much of a dent on the glass, but on lesser devices or with enough pressure that could kill your tablet and ruin your day. Overall the construction seems pretty solid. The finish on the outside is smooth and glossy, something that feels good in the hand. There’s no rattling or other obvious issues when you shake it. If you unscrew the knurled cap the pen turns into an actual pen. The cap, by the way, is sealed with a rubber gasket to be completely watertight. The actual pen components are compatible with Parker style refills such as the Schmidt EasyFlow 9000 refills that I prefer in all my pens, which is handy since the version provided with the pen from the factory doesn’t bring me joy. It just feels like I’m scratching on the paper instead of writing smoothly. Writing with the pen feels pretty comfortable in the hand. It is just chunky and weighty enough to feel sturdy without being too far over the line towards uncomfortably heavy. The cap for the pen can be screwed onto the rear of the pen for storage, allowing you to use both ends of the pen to write on different things. So, that’s all good, but how does it actually work in the cockpit? With the stylus attachment you absolutely 100% can write faster. It’s about the same speed as writing with a regular pen on paper and makes all the difference. The actual pen part of the pen also works as advertised, comfortable in the hand and easy to use. The one thing that I could ding this pen for is the clip. My usual place to store my writing instrument in the cockpit is clipped to the strap around my kneeboard. 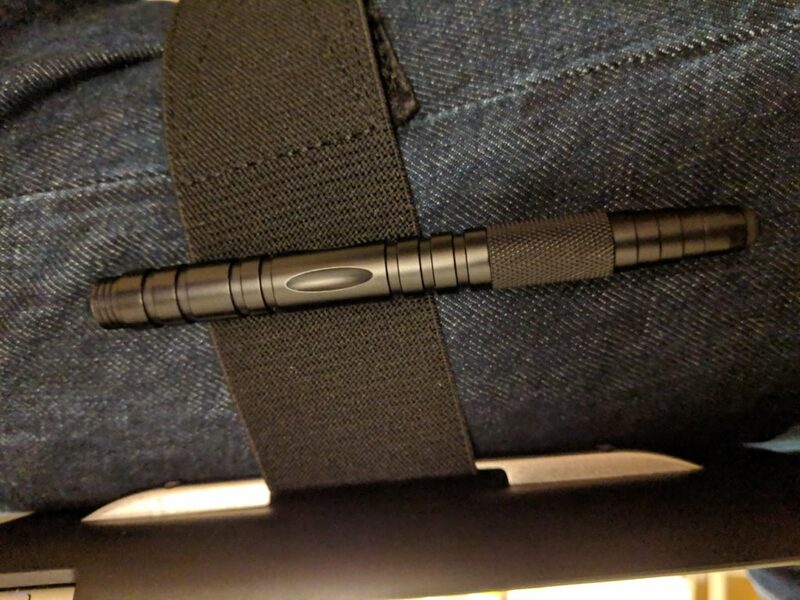 With this pen the clip is very tight, and getting it to fit around the thick elastic strap takes some effort. On the plus side the pen ain’t going nowhere, but it does make it a bit difficult to attach without using two hands. That said, it’s a minor gripe. The pen is a damn fine implement that works exactly as intended. It makes writing on tablets quicker, works just fine as an actual pen, and doesn’t have any extra gimmicks. And since it takes my preferred pen refills it feels just like the other pens I’m used to using. I like it. Works for exactly what I need it to do, does the job well, and I really only have a minor gripe about the clip.